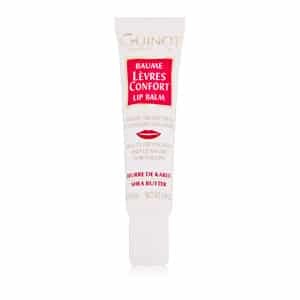 Guinot Baume Levres Confort Lip Balm conditions and nourishes to combat dry, chapped lips. Formulated with avocado extract and fatty acid-rich vitamin F glycerides, it soothes and strengthens, protecting against damaging environmental stressors. Conditioning shea butter and sunflower oil soften and smooth as vitamin E hydrates and offers rich, antioxidant benefits to neutralize free-radicals and promote a healthy, supple look and feel. 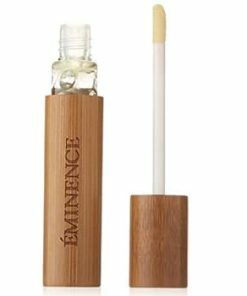 Guinot Baume Levres Confort Lip Balm is a daily-use lip balm that instantly relieves dry, chapped lips and guards against UV and free radical damage. Guinot Baume Levres Confort Lip Balm is formulated with shea butter to soften and moisturize for plump, calm, and kissably smooth lips. 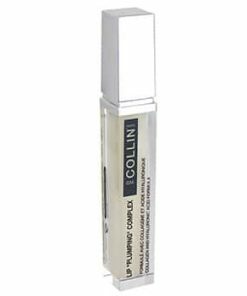 Lips are soft and supple. 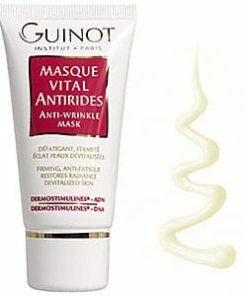 Apply Guinot Baum Levres Confort Lip Balm evenly to lips using the beveled tip. Reapply as needed throughout the day. Caprylic/Capric/Succinic Triglyceride, Octyldodecanol, Polydecene, Beeswax/Cire d’Abeille (Cera Alba), Hydrogenated Microcrystalline Wax, Silica, Trihydroxystearin, Butyrospermum Parkii (Shea) Butter, VP/Hexadecene Copolymer, Glyceryl Linoleate, Microcrystalline Wax (Microcristallina Cera), Glyceryl Oleate, Silica Dimethyl Silylate, Allantoin, Tocopheryl Acetate, Fragrance (Parfum), Glycine Soja (Soybean) Oil, Glycine Soja (Soybean) Sterols, Helianthus Annuus (Sunflower) Seed Oil Unsaponifiables, Hexyl Laura te, Glyceryl Linoleate, Persea Gratissima (Avocado) Oil, Diisostearyl Malate, Titanium Dioxide (Cl 7789), Cetearyl Alcohol, Ascorbyl Palmitate, Hydrogenated Palm Glycerides Citrate, Tocopherol.